All Madame wants to do these days is sit up. Once I could hold her horizontal and walk around or play with her on the floor, but now if she’s awake and not sitting up she’s generally unhappy. This is good I guess, developmentally speaking, but it does require a lot of effort. Usually by the end of the day nothing will console her unless she’s right in the middle of whatever we are doing, so we keep her in her Baby Bjorn Baby Carrier and walk around the house with her. What I’d really like is a bouncy-seat that will keep her a little more upright (without letting her tip over of course). I was looking at the Baby Bjorn website today and I came across the Baby Sitter 1-2-3. 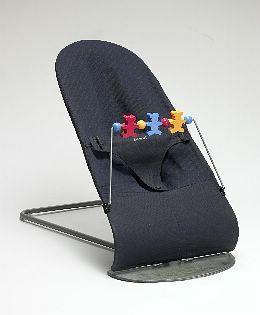 It’s a bouncy seat that will adjust to 3 different positions, depending on how old your child is. It looks like it might do the job, and I’m very happy with the carrier they make, so I might try it. Anyone have one?